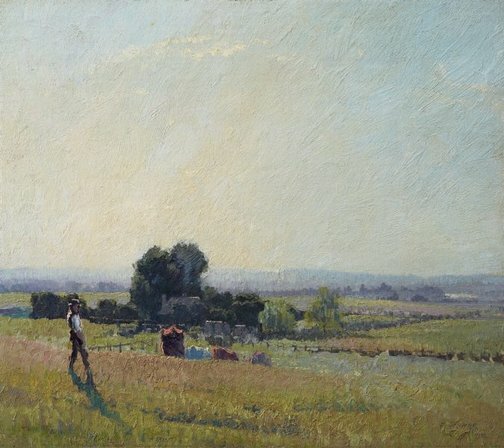 Often regarded as the last of the Australian impressionists, Elioth Gruner established his reputation as perhaps the country’s most accomplished and lyrical painter of light. While working as a draper’s assistant at Farmer’s department store, Gruner studied at Julian Ashton’s Sydney Art School, eventually becoming Ashton’s assistant at the school in 1914. Early in his career, Gruner became inspired by influential Melbourne-based artist and tonal theorist Max Meldrum. The broken brushwork in the fore-ground of 'Morning light' also reflects the influence of E Phillips Fox, as well as the modernist experiments of his younger contemporaries Roland Wakelin and Grace Cossington Smith. 'Morning light' was awarded the 1916 Wynne Prize and immediately purchased by the trustees. It was the first work by Gruner to enter its collection. The work is hailed as the high point of Gruner’s Emu Plains series of 1915–19 and is one of his greatest masterpieces. Signed and dated l.r. corner, black (oil?) "E. GRÜNER/1916". Barry Pearce. Australian Collection 2., Art Gallery of New South Wales collection series , 'Elioth Gruner: Morning Light', Sydney, 1981, cover (colour illus. ), back (illus.). Jean Andrade., The New outlook [vol. 1, no. 8] , 'Art Notes', Sydney, 12 Jul 1922. Basil Burdett., The Herald , 'Gruner, a poet in paint', Melbourne, 06 Jul 1940, (illus.). Helen Campbell, Look , 'Wynne Centenary', pg. 20-21, Heidelberg, Apr 1997, 21 (colour illus.). Deboarh Clark, Elioth Gruner: the texture of light , 'Elioth Gruner: the texture of light', pg. 9-89, Canberra, 2014, 26 (colour illus. ), 29, 95, 100. Renée Free, Lloyd Rees Retrospective , 'The Landscape of Lloyd Rees', pg. 4-13, Sydney, 1969, 7. Leon Gellert., Sunday telegraph , 'Gruner ... apostle of the dawn', Sydney, 22 Jan 1967, unknown. Lionel Lindsay., Art in Australia [vol. 1, no. 4] , '25 Years of Australian Art', Sydney, 1918. Alicia Parlby, Look , 'Gruner lives! Old works a hit with young viewers', pg. 12, Sydney, Dec 2003-Jan 2004, 12 (colour illus.). Barry Pearce, The Wynne prize: an Australian landscape tradition , 'Introduction', pg. 6-9, Sydney, 1986, 6, 9, 11 (illus. ), 19, 25. Barry Pearce, Parallel visions: works from the Australian collection , 'Introduction: Convergent Spirits', pg. 10-19, Sydney, 2002, 12, 40 (colour illus. ), 143, 147. Ursula Prunster, Australian art: in the Art Gallery of New South Wales , 'Home and abroad', pg. 73-74, Sydney, 2000, 100 (colour illus. ), 300. Daniel Thomas, Creating Australia: 200 years of art 1788-1988 , 'Twentieth-Century Art: Culture', pg.146, Melbourne, 1988, 150 (colour illus. ), 246. The Sydney morning herald , 'Elioth Gruner', pg. 14, Sydney, 21 Oct 1939, 14. 150 years of Australian art , Sydney, 1938. cat.no. 711; titled 'The morning light'. The morning bulletin , 'Art in Australia', pg. 10, Rockhampton, 17 Mar 1919, 10. The Queenslander , 'Seasonable gift books', pg. 3, Brisbane, 04 Jan 1919, 3. The Sydney morning herald , 'Wynne art-prize award, 1916', pg. 16, Sydney, 25 Nov 1916, 16. The Sydney morning herald , 'Society of artists', pg. 3, Sydney, 24 Nov 1916, 3. Look , 'Spring frost corner', Sydney, Jan 2017-Feb 2017, 12-13 (colour illus.). 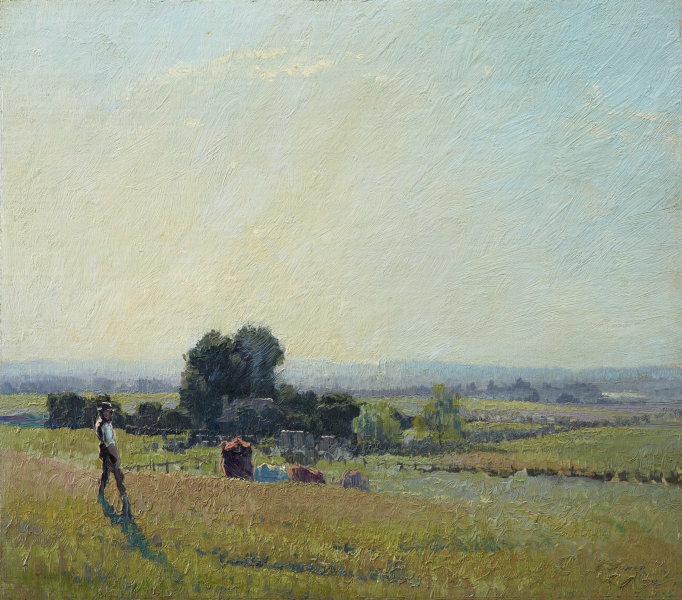 The Mercury , 'Clark art exhibition: notes on the artists: Elioth Gruner', pg. 3, Hobart, 08 Jul 1926, 3. The CBUS collection of Australian art , Melbourne, 2009, 41. I blame Duchamp: my life's adventures in art , 'John Bull and the Little Boy at Manly', pg. 321-333, Sydney, 2009, 331. Look , Heidelberg, Mar 1998, 4 (colour illus.). Look , Heidelberg, Feb 1998, 4 (colour illus.). Australian Modern Painting Between the Wars 1914-1939 , 'Light in Sydney', pg. 30-41, Sydney, 1989, 38. Art and Australia , 'Victorian favourites: a conversation - Elwyn Lynn and Lloyd Rees', pg. 49-56, Sydney, Spring 1984, 52. Elioth Gruner 1882-1939 , Sydney, 1983, cover (colour illus.). Australian collection 2 , Sydney, 1981, (colour illus.). 200 Years of Australian painting , Rushcutters Bay, 1971, 35 (colour illus. ).